Rent villas and apartments in Povlja, Croatia with private pools. Book affordable holiday rentals that are near a beach. This beautiful holiday home with pool is located in a splendid bay, surrounded by olive and pine trees, near Povlja on the island of Brač. This nice and functionally furnished holiday is located in the first floor of a family house, in the first row to the sea. Spend a pleasant holiday in this nice and functionally furnished holiday apartment near the sea, in the village of Povlja on the island of Brač. These functional furnished holiday apartments CDB626 and CDB627 are located in a family house, first row to the sea, only about 50 m from the pebble beach and beautiful sea. This 4-bedroom villa for up to 9 guests is located in Povlja and has a private swimming pool. This 3-bedroom villa for up to 7 guests is located in Povlja and has a private swimming pool. This 5-bedroom villa for up to 10 guests is located in Povlja and has a private swimming pool. This 2-bedroom villa for up to 4 guests is located in Povlja and has a private swimming pool. Spend a pleasant summer holiday on the island of Brač, in this comfortably furnished semi-detached house. The accommodation is located in a peaceful location. 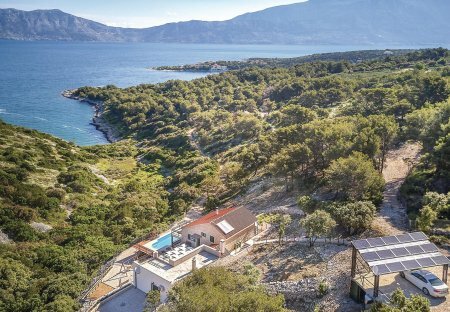 This holiday home lies solitary in an olive grove on a hill above the village of Povlja on the north side of the island of Brac. This 3 bedroom apartment and sleeps 6 people. It has WiFi, parking nearby and air conditioning.